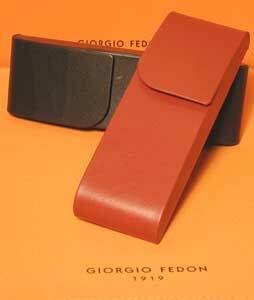 Designed for everyone who is looking for something original and elegant, for themselves or as a gift, the prestigious GIORGIO FEDON 1919 collection is the result of the fusion of high technology, design and fashion. The range consists of leather or leather like goods and writing tools, as well as personal and office accessories in covered aluminum, without any visible stitching. FEDON world leader in the production of cases for eyewear has successfully combined accurate operational specifications with skilled craftsmanship. These high class items are characterized by the quality of classical working and by the clean lines of the designs. 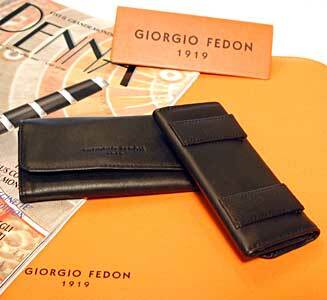 The GIORGIO FEDON 1919 collection is ideal for people who love modern, functional and high class accessories. The materials used in the creation of the items below are both ecopelle, a manmade material that looks and feels like soft subtle nappa leather, without the risk of scratching, scuffing or other cosmetic defects. The material is strong, water resistant, can be cleaned and maintained to its original beauty. 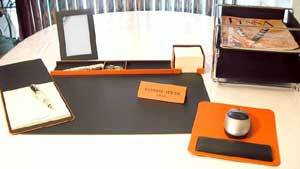 All of the rigid items are made on an aluminum core, covered in either ecopelle or genuine nappa leather. The nappa leather, as with all fine leathers requires some degree of care and maintenance to preserve its beautiful finish throughout its life span. Portapenne-2 Rigid pen case designed to take two pens or one pen and a small pair of reading glasses. The removable inner divider is made of soft velvety fabric. The compact design of the case makes it particularly strong and functional. Strong aluminum core covered in either soft Italian leather or simulated leather with hidden magnetic catch or inset button. Shown in black and orange, it is available in both single and double versions Single version shown below. 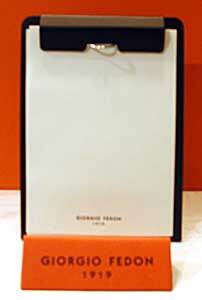 Smaller version of the basic clip board available in all colors. All started on the famous aluminum core for strength and durability. This is the larger version of the P-Agenda. Innovative in its simplicity of design and complete with a weekly planning diary, it closes on all four sides to hold you notes and documents securely. The patented catch with hidden magnet completes the fine line of this product. 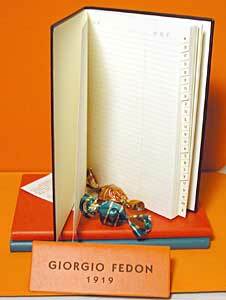 Included in this version is an address book and daily planner. A clear plastic ruler and the inside flap holds credit cards, business cards, theatre tickets and other important documents. 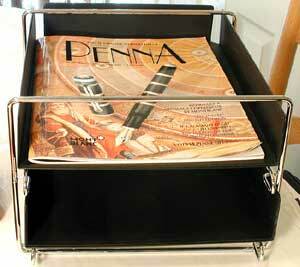 There is also a loop for your favorite writing instrument. Sorry no longer available with belt loops. 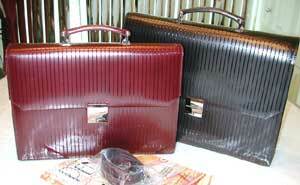 Purse with capacious pouch and zip closing. 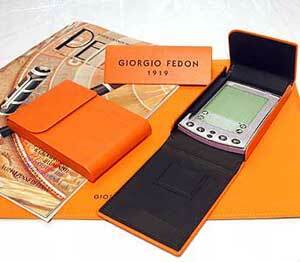 It is lined with 1919 jacquard satin, and matches the other colored accessories of the GIORGIO FEDON 1919 range. 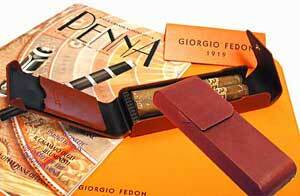 Cigar holder with self-lock, designed for the cigar expert who pays attention to detail. Inside, a patented humidifier maintains the ideal humidity level. The art of enriching the everyday habits with a touch of class is definitely one of the distinctive traits of the GIORGIO FEDON 1919 collection. Inside is the divider for 5 cigarettes or the larger version pictured here, holding 10 cigarettes, without divider. 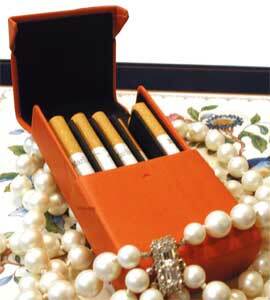 A patented humidifier allows the cigarettes to be kept in perfect condition. The lines, absence of stitching and the hidden magnetic catch make this case a high class, practical accessory. Designed for medium-sized sight glasses or sunglasses. Stand made of steel rods for two A4 trays. 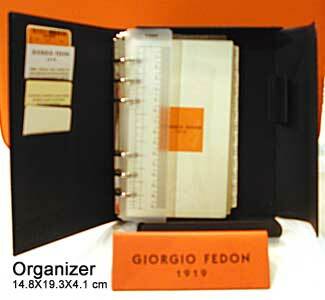 the GIORGIO FEDON 1919 desk range. 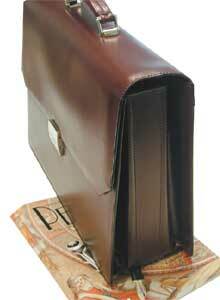 Small document carrier with one compartment, fitted with a removable shoulder strap. 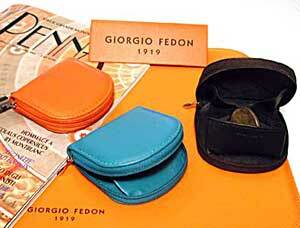 The smart design is typical of the GIORGIO FEDON 1919 collection. 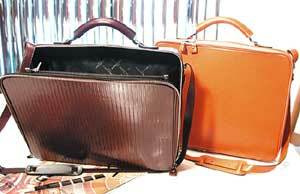 Document carrier with three compartments, fitted with a removable shoulder strap. 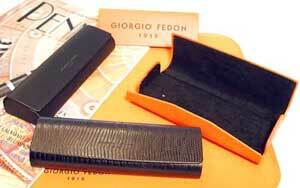 Interior systemized and lined in Fedon 1919 jacquard satin. a computer. Soft, subtle leather in smooth finish. 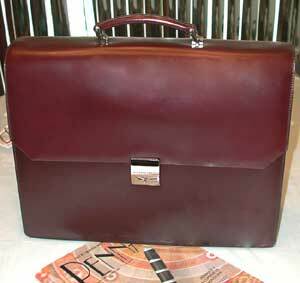 Attractive document case with zip closing, shoulder strap, dividers and systemized interior. A pleasure to carry, not only on business.